800w CEA Rated! 105A Fuse Rating! Amazing Engineering! CEA Compliant Ratings! Truly Legitimate Power! 1000w CEA Rated! Amazing Quality and Engineering! 500w CEA Rated! Amazing Quality and Engineering! 350w CEA Rated! Amazing Quality and Engineering! 90 Day Money back Guarantee! 300w CEA Rated! Trending at $101.39eBay determines this price through a machine learned model of the product's sale prices within the last 90 days. 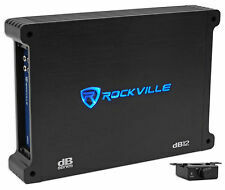 (1) Rockville dB12 2000 Watt/1000w RMS Mono Class D 2 Ohm Amplifier Car Audio Amp. Video of dB12 The dB12 is a class D monoblock high power amplifier with 2,000 watts peak output, 1,000 watts RMS output, and 500 watts CEA-2006 rated power. 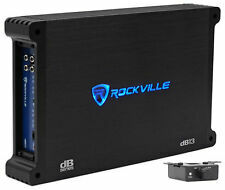 (1) Rockville dB13 3000 Watt/1500w RMS Mono Class D 2 Ohm Amplifier Car Audio Amp. Video of dB13 The dB13 is a class D monoblock high power amplifier with 3,000 watts peak output, 1,500 watts RMS output, and 750 watts CEA-2006 rated power. (1) Rockville dB15 6000 Watt/3000w RMS Mono Class D 2 Ohm Amplifier Car Audio Amp. The dB15 is a class D monoblock high power amplifier with 6,000 watts peak output, 3,000 watts RMS output, and 1500 watts CEA-2006 rated power. The dB15 is a class D monoblock high power amplifier with 6,000 watts peak output, 3,000 watts RMS output, and 1500 watts CEA-2006 rated power. All of the mono amplifiers in the dB series are 2 ohm stable. The RXD-M3 is a class D monoblock high power amplifier with 4,000 watts peak output, 2,000 watts RMS output and 1000 watts CEA-2006 rated power. We redesigned the layout of the PCB boards to allow the amp to run smooth and cool. The dB12 is a class D monoblock high power amplifier with 2,000 watts peak output, 1,000 watts RMS output, and 500 watts CEA-2006 rated power. All of the mono amplifiers in the dB series are 2 ohm stable. They perform more efficiently resulting in even dB of sound. The dB12 is a class D monoblock high power amplifier with 2,000 watts peak output, 1,000 watts RMS output, and 500 watts CEA-2006 rated power. The RXD-M4 is a class D monoblock high power amplifier with 6,000 watts peak output, 3,000 watts RMS output and 1500 watts CEA-2006 rated power. We redesigned the layout of the PCB boards to allow the amp to run smooth and cool. L@@K!!! INCLUDES 100% OFC AMPLIFIER WIRE KIT !!! The RXD-M2 is a class D monoblock high power amplifier with 3,000 watts peak output, 1,500 watts RMS output and 750 watts CEA-2006 rated power. Rockville RXD-M2 3000 Watt/1500w RMS Mono Class D 1 Ohm Car Stereo Amplifier With Optical Coupler Technology. (2) Rockville W12K6D4 V2 12" 2400w Car Audio Subwoofer Dual 4-Ohm Sub CEA Compliant. Video of W12K6D4 V2 Rockville W12K6D4 V2 K6 Series 12" Dual 4-Ohm Car Subwoofer. Item Code: (2) W12K6D4 V2 RXD-M3 RWK41. Item Code: dB15 For 44DL7S122. They perform more efficiently resulting in even dB of sound. The dB15 is a class D monoblock high power amplifier with 6,000 watts peak output, 3,000 watts RMS output, and 1500 watts CEA-2006 rated power. (1) Rockville W12K6D4 V2 12" 2400w Car Audio Subwoofer Dual 4-Ohm Sub CEA Compliant. Video of W12K6D4 V2 Rockville W12K6D4 V2 K6 Series 12" Dual 4-Ohm Car Subwoofer. Item Code: W12K6D4 V2 dB12 RWK41. The dB13 is a class D monoblock high power amplifier with 3,000 watts peak output, 1,500 watts RMS output, and 750 watts CEA-2006 rated power. All of the mono amplifiers in the dB series are 2 ohm stable. (1) Rockville dB11 1400w/700w RMS Mono Class D 2-Ohm Amplifier Car Amp Bass Remote. Video of dB11 (1) dB11 Amplifier. Rockville dB11 1400w/700w RMS 2-Ohm Class-D Mono Car Amplifier and Bass Remote. Item Code: dB11 RWK81. (1) Rockville W15K6D4 V2 15" 4000w Car Audio Subwoofer Dual 4-Ohm Sub CEA Compliant. Item Code: W15K6D4 V2 dB14 RWK4CU. (1) Rockville dB14 4000 Watt/2000w RMS Mono Class D 2 Ohm Amplifier Car Audio Amp. 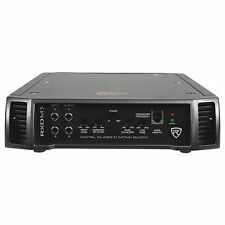 Rockville RVA600.1 1200 Watts Peak/200 Watts RMS Mono Block Class AB Car Amplifier With Bass Remote. 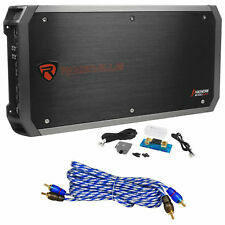 Rockville RVA600.1 Mono Block Car Amplifier and Wiring Kit. Item Code: RVA600.1 RB. Products go through months of extensive testing before they reach your hands. Rockville RV10.1A Single 10” 500 Watts Peak / 175 Watts RMS Bass Enclosure System With Matching Mono Block Class A/B Car Amplifier With Wiring Kit and Wired Bass Remote Knob. This system includes a top of the line ported enclosure which gives you more punchy and better sounding bass. 500w CEA Rating, 2.5" Voice Coils are Made in USA !! !